Superior-quality microfiber combines with our unique BacLock®* antibacterial agent to create a multipurpose cloth that can be used wet or dry to clean everything. The super-versatile EnviroCloth® is the perfect replacement for chemical-laden, all-purpose cleaners, and eliminates the need for wasteful paper towels, so it’s also more sustainable for the environment! Highly effective and easy to care for; between launderings, simply rinse, wring out and hang to dry. Available in five colors, allowing you to color-code for different purposes or rooms. Getting all the surfaces in your home as clean as possible, as quickly as possible, can be challenging. In addition, many of today’s popular cleaners contain harsh chemicals that can make your family sick. And using paper towels to clean adds to the problem of overloaded landfills and deforestation. 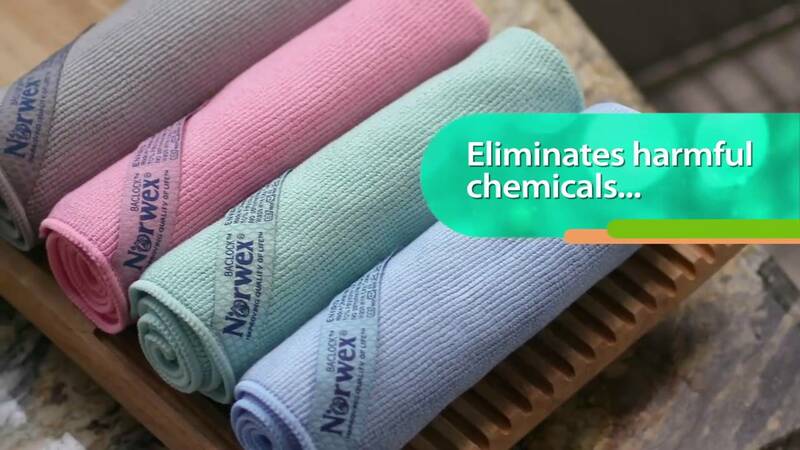 Clean more safely, quickly and thoroughly using super-absorbent Norwex EnviroCloths. You’ll save time, money and the environment using only water—reducing landfill waste, eliminating chemicals in waterways and protecting your family’s health as you cut down on dust and reduce chemicals in your home. Now thicker, more absorbent and even more effective! Use dry to attract dust and dirt particles, and wet to wipe away dirt and debris from all washable surfaces using only water. Fold the cloth so you have eight clean sides to work with. Wipe with even strokes. Norwex Microfiber has the ability to remove up to 99% of bacteria from a surface when following the proper care and use instructions. Used dry for dusting, it creates static electricity that lifts the smallest particles of dust and dirt up into the cloth and prevents them from resettling on surfaces. and heavily soiled areas, it picks up everything using water. Cleaned surfaces become so clean that new dirt and dust do not return as quickly. The BacLock* in the cloth—our exclusive micro silver antibacterial agent—goes to work to self-purify and inhibit odors from bacteria, mold and mildew growth within the cloth within 24 hours so that it is ready to use again. and water or chemical cleaners, including bathrooms (taps, sinks, tubs, counters, toilets and more), walls, windows, floors, vehicles, toys, tools, kitchen appliances and surfaces, outdoor furniture and much more. At 1/200th the size of a human hair, Norwex Microfiber is one of the most innovative products in the cleaning industry today. *Contains BacLock, an antibacterial agent for self- cleansing purposes only. The agent is solely designed to inhibit odor from bacteria, mold and/or mildew growth within the product.